Ryan Nyquist and his family moved back to North Carolina! Check out Ryan throwing down at his private park, The Unit! A few years ago Ryan Nyquist moved with his family back to his original hometown in San Jose, California. Last year they decided it was time to head back to North Carolina where Ryan spent most of his professional years as a rider, helping to make Greenville known as “Pro Town”. Although he’s living in Wilmington two hours from Greenville, he’s a hell of a lot closer than being in California. That means he has been able to get plenty of riding time in at his private park, The Unit, once again! Here’s a video with a bunch of dialed riding that Ryan threw down during a recent session! You already know Ryan brought his deep bag of tricks and put the endless lines of the place to good use! What better way to get your first Haro frame than from the hands of @ryannyquist. New Zealand’s Josh de Reus (@joshdbmx) is on the @premiumbmx_ team and we decided to get him on a Haro frame / Premium parts deal to sync up with @chadkerley and @mikegraybmx. Josh, Chad and Mike head on a @premiumbmx_ trip to Northern California next week. Look for content from those guys soon and welcome to Haro Josh! Haro Bikes have added Josh de Reus to their line up! Similar to how Chad Kerley and Mike Gray went from riding fully for Premium on over to Haro with Premium parts, Josh will be on the same program! To kick things off, they had Ryan Nyquist hook Josh up with a new CK Frame. This should mean that we’ll be seeing more from Josh here in the near future. It also makes us wonder if Premium will be transitioning to just a parts brand in the future. I guess we’ll find out if Stephon Fung and Blake Peters make the same transition since everyone else on the Premium team have made the switch on over to Haro with Premium parts. We have a feeling that might just be coming sooner than later. Curious what the course is like for the Vans BMX Pro Cup in Huntington Beach? Here’s a quick video where we take a ride with Ryan Nyquist as he follows Gary Young while he flows through the bowl! It’s safe to say we’ll be seeing plenty of wild riding going down in the contest. “Ryan Nyquist and Gary Young take you on a hot lap around the new Vans BMX Pro Cup Park and show you some of the lines that Gary Young will be taking this week in the World Championship event while Nyquist tries to stay hot on his tail. “I have been sitting on this video for a little and I’m pretty sure most people have not seen it since i think it was made as a promotional item for Adidas when they had a BMX team in the late 90’s to early 2000’s. There is some awesome riding from a very young Nyquist and Mirra in his absolute prime! It’s always a good day when a new video featuring Andy Maguire and the Santa Cruz crew surfaces online. Here’s a fresh mix of footage from Andy, Ryan Nyquist, Jackson Allen and many more from the Santa Cruz, California area getting down on street spots, skateparks and trails. This is packed with awesome riding and some real clean film work. Overall this is a great BMX video from start to finish, so take a look! You won’t be disappointed. “Andy Maguire has been holding it down for the street scene in Santa Cruz for quite some time now so when he contacted Chris Bracamonte about filming some sort of scene report last year we were immediately on board. Here’s a few words about Santa Cruz from the man himself. “A severed blue hand, screaming in pain; numerous bigfoot sightings; a 93-year old wooden roller coaster; and free Eddie Money concerts once a year. Aside from rich ocean scenery surrounded by forest seclusion, the small coastal town of Santa Cruz, California is a place that oozes character. On any given day, you will probably stumble across dreadlocked hippies, young skate punks who were born and raised gliding across concrete, surfers who come from all walks of life or the awkward UC student taking their first steps into life as an adult. I was definitely the last example when I moved here from the suburbs over 12 years ago. At first, this place seemed like an uncomfortable, strange place, but over the years, the quirks and the lifestyle of the area slowly normalized to the point that it fills me with appreciation to call this place my home. It’s been a really interesting time in BMX. We have seen a number of old products revamped and brought back to life. It looks like Haro Bikes have decided to continue that trend with their Jackhammer 4-Piece Bars! This is pretty awesome and we’re sure plenty of you Mid / Old School guys will be real stoked on this one. Haro Bikes have released Ryan Nyquist‘s new signature Jackhammer 4-Piece Bars for you to get your hands on! These bars are based off the originals from the late 90’s / early 00’s, but with modern geometry. 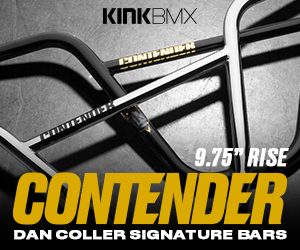 The bars are made from full 4130 chromoly with three rise options; 8.5″, 9″ and 9.5″. All three sizes have 10-degrees of backsweep and 3-degrees of upsweep. Based off the photo we would assume they have a 28″ width. If you’re digging these bars, hit up your favorite Haro Bikes dealer to get a set ordered up! “It’s 2017 and the Haro Jackhammer looking bars are in stock!!! Get the look and feel of the late 90’s / early 2000’s all over again! Below is a video featuring Ryan Nyquist talking about the Jackhammer bars making their return!